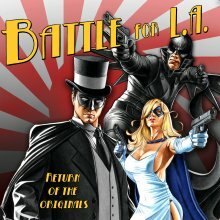 This week the PopCult Bookshelf listens to another fine Audiocomics production based on a Moonstone Publishing novella, “Battle For L.A.” Pulp heroes The Black Bat, Domino Lady, Secret Agent X, and The Phantom Detective, and classic comic character Airboy team up to fight UFOs over Los Angeles during the waning days of World War II. The illustrated novella by CJ Henderson and Mark Sparacio tells what really happened during true-life incident, where US anti-aircraft shore artillery opened fire on an unidentified object in the skies above Los Angeles. Over the course of the next three hours, “swarms of planes” were reported as roaming the skies above the city of angels, though in the end the only actual damage was the result of traffic accidents, friendly fire from the attack, and in some cases, heart attacks caused by stress. “Battle For L.A.” tells us how a group of “Mystery Men” formed an allegience to combat a manace from another world. A “creature of the night,” The Black Bat enlists the aid of dapper crime-fighter, The Phantom Detective to investigate a strange case on behalf of the Army. The discovery of a strange metal cannister held by Japanese agents starts them on an amazing adventure. This is great fun. it’s an old-school radio-style drama that presents colorful characters in a fantastic adventure. Dramatic audio presentations, like comics, have the advantage of being able to recreate bygone eras without busting the budget. The added advantage of Audiocomics is that the listener is totally engaged, using their imaginations to fully realize and visualize the story. Henderson’s story is a classic pulp adventure. This production is spot-on. The voice cast does a great job breathing life into the characters.The sound effects and music work well and the overall production is engaging and entertaining. Josh Pollack voices The Phantom Detective, while John Strain is The Black Bat. Additional voices include Karen Stillwell as The Domino Lady, Chris Martin as Airboy and Matt Morris at Secret Agent X. A large cast of additional performers fills out the story. Direction and sound design is by Lance Roger Axt. You can order “Battle For L.A.” from iTunes, Amazon and Audiocomics Digital Direct. It’s a digital download and a great value for over forty minutes of rollicking old-school adventure.